On 18 May 2016 our Pinehurst neighbors spoke to a sold-out crowd about the next president, the threats facing the America, and the qualities that General George C. Marshall had that made him so successful. 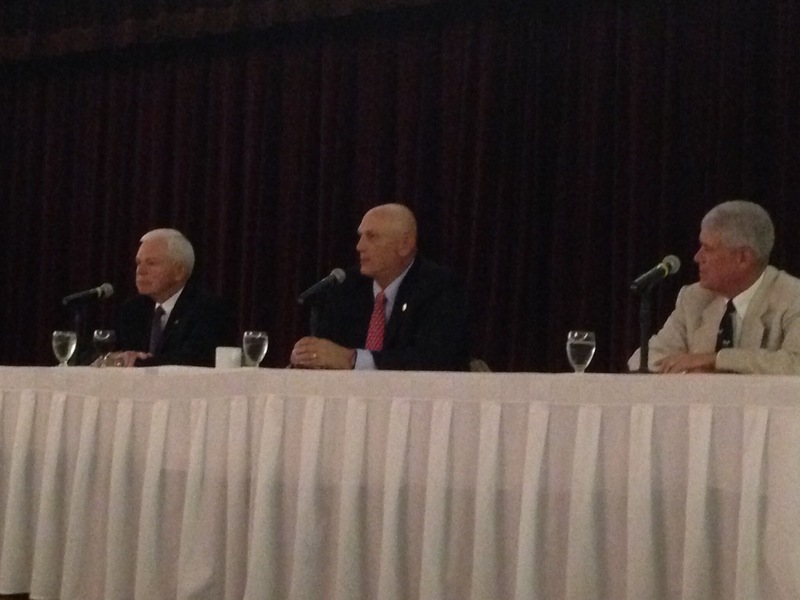 Our community was lucky to have General Buck Kernan, General Ray Odierno, and General Lance Smith share their collective insights as they reflected on the past and the future. General Buck Kernan spent the majority of his career in Army Ranger and Airborne units rising to the position of Supreme Allied Commander Atlantic. General Kernan is a Ranger legend and mentored some of the greatest Ranger and Airborne leaders. General Ray Odierno was best known for his long tenure as a commander at various levels in Iraq culminating in his command of the all the coalition forces in Iraq, before being selected as the Chief of Staff of the Army filling General Marshall’s old position. General Lance Smith is a highly decorated Air Force command pilot with over 165 combat missions and rose to the position of commander U.S. Joint Forces Command and NATO Supreme Allied Commander for Transformation. All three generals are combat-decorated veterans and well respected. They were experts in their military field, advised senior civilian leaders, and continue to serve when called upon by the military to lend their knowledge and judgment. Between them they wore 12 stars, participated in four wars and earned 2 purple hearts, 4 Bronze Stars, and 3 Silver Stars. What is the biggest threat to the United States? The economy is poor and our debt is becoming too large as a part of our economy. We can’t afford the security we need with this economy. Not having the strategic and decisive leadership needed to devise smart policies that can be successful in the new world order that we live in. Not leading diplomatically in the Middle East where our leadership is still urgently wanted and needed. Who are our Middle East allies? No one in the Middle East has faith in the US right now. We can’t keep our promises. Middle Eastern allies are not sure where American stands because our policy is so unclear. By telegraphing publicly that we are not willing to put combat forces (“boots on the ground”) into action if needed, we have weakened all our policy options in the region and made our allies lose trust in us. The vacuum of power we create in the Middle East by our leadership absence is going to be filled by actors with worse intentions. What attributes would you want to see in our next president? We need a relationship re-builder. Someone who will invest in the capacity and capability of the military. Someone who leads in a unifying way. We are divided as a nation and have been for about 15 years. A strategic thinker that can develop a policy that is clear to the world. Someone who will recruit the right staff and listen to them. Someone willing and able to get congress on board with their policies. Ability to put the full funding needed into the right projects to support our policy. Someone who isn’t all-knowing and will hire talented people and listen to them. Stick with your choices and lead with courage. Provide common vison and purpose. Work with congress and make them row together to fulfill their obligation as a legislature. Is there a North Korean threat? We do not understand the motivations of the current president of NK. They have the largest artillery force in the world and can reach Seoul with it. China may not have much control over NK anymore. We need to worry about a miscalculation on someone’s part. Ranger school just had its first female graduates, what say you? It’s a demanding leadership school that teaches you a lot about yourself. I was asked to look at admitting women to ranger school but some policy wonk made the decision before the military could finish the assessment. Trust me no standards were lowered those women met the requirements like e very graduate before them. The real question has not been asked about Ranger graduates. What is the value added in war to having Ranger trained women? And what about women in combat positions? No doubt some women can physically meet the initial requirements to be in the Infantry. The real question to me is how long can they physically do the jobs. The infantry is ruthless on the human body. What are the long term affects? We don’t know. We need to ask ourselves ultimately is it a combat multiplier to have women in combat jobs? Combat is not dramatic like the movies portray it. It’s ugly and often hand to hand. We need to think about a 120 pound woman fighting a 200 pound man and what our enemies do to women. There is much to be addressed on this topic and we can’t just hand the problem to our junior leaders and tell them to figure it out. What is your opinion on a national service requirement? We can never go back to the draft. We all served in that era and the military was a mess then compared to how amazing our all-volunteer military. At least one year of national service that teaches our citizens about selfless service is a great idea as long as we don’t force people into the military. Let them serve in a variety of ways. General George C. Marshall was an esteemed citizen of Pinehurst. What were the attributes that made him a great leader and trusted advisor? He was a first class Soldier-Statesman that was able to develop an Army on a large scale while handling the political pressures he was dealt. I wrote my paper at the War College about him as a man I most admired. He was selfless. He knew he was needed in DC during the war and chose to send others into the combat theaters to develop them instead of himself. There is a book called 19 Stars (http://www.amazon.com/Nineteen-Stars-Military-Character-Leadership/dp/0891411488 ) that compares the great generals of WWII and General Marshall was hands-down the best of the best because he was balanced, gave a vision, and was open to smart suggestions. What do you think made you successful and makes others successful? Be able to build and earn trust through competence, commitment, and character. Love what you do. You have to love your career to survive in an up-or-out system. Prepare yourself to be an expert in your field. Underwrite the risks and mistakes of your people. Fix the mistakes and ensure everyone learns from them but ensure you let people make mistakes instead of just throwing them away. My dad told me that I should never advance myself at the expense of my peers and men. Luck has a role in success. You will do better if you have good leaders to learn from. Young leaders must be able to make mistakes without ending their career. The event was hosted by Dr. John Dempsey President of the Sandhills Community College. It was coordinated by the Tufts Archive and Given Memorial Library team and sponsored by some amazing donors. It was held at the always excellent Pinehurst Resort. Previous Post Are we developing and retaining “Renaissance leaders”?